IBM WebSphere Enterprise Service Bus is a flexible connectivity infrastructure for integrating applications and services. It is designed to enable the development of a service-oriented architecture (SOA). 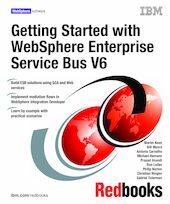 This IBM Redbooks publication guides you through the capabilities and product features of WebSphere Enterprise Service Bus V6.0. It also contains step-by-step examples of how to build resources for WebSphere Enterprise Service Bus using WebSphere Integration Developer. Part 1 introduces WebSphere Enterprise Service Bus and positions it among other SOA and Enterprise Service Bus product offerings from IBM. Part 2 describes how to install and configure both WebSphere Enterprise Service Bus and WebSphere Integration Developer and explains how to perform key concepts and tasks using these products. Part 3 explains the administration and testing capabilities, including step-by-step examples. Part 4 provides development examples that show step-by-step how to develop solutions using mediation primitives, how to integrate with services, and how to deliver qualities of service.